Donkeys or horses? So hard to decide! ...But those long ears, sparkling personalities, musical brays, and scruffy coats endeared the donkey to our family. Meet Paco. He is just the cutest guy! He is a half standard, half mini donkey. This is Not our beautiful Draft Mule pulling a wagon. We met this lovely girl at a Fair. I am adding this picture here to show just how COOL Mules are. 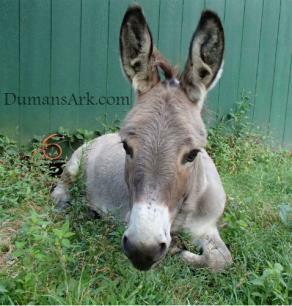 Mules don't seem to be taken seriously, or 'get much love' in Equine circles. That is, unless you visit the South, where they are trained well and work ranches, pull buggies, plows, act as weed eaters and participate in THE MOST AWESOME SIGHTS EVER: Mule Games!! 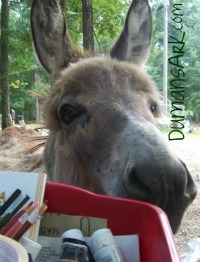 Want to support Mules? 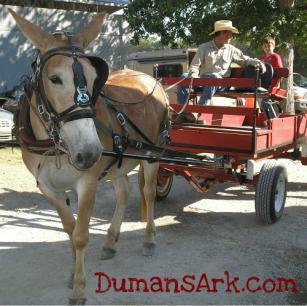 Visit fairs and shows where Mules are featured. It's a great way to learn about what these animals can do too. The contents of this page for Equine is still under construction. Please check back later!